The Third Sunday after Epiphany is only commemorated today because of St Agnes’ feast. Next Sunday is Septuagesima, so today is also the last Sunday that the Alleluia will be sung as we enter into the pre-Lenten season of Gesimatide, in some places after None the symbolic ceremonial known as “Burying the Alleluia” takes place. She was buried on the Via Nomentana where a cemetery stands in her name. 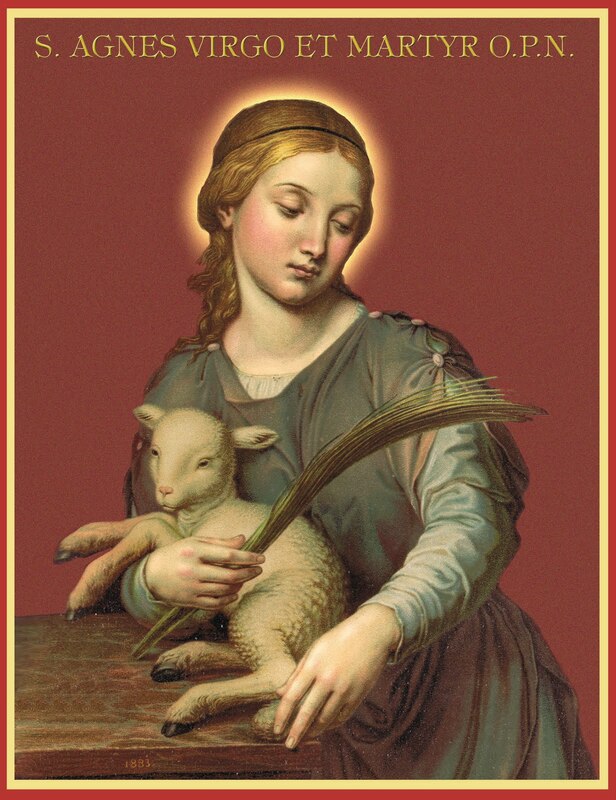 Over the centuries Agnes, which means “chaste” in Greek, has become the standard for chastity, purity and virginal innocence and she is always depicted with a lamb – the Lamb of God – Agnus Dei. She (Agnete) is forever commemorated in the Nobis quoque peccatoribus – the Invocation of Saints in the Canon of the Holy Mass. Of Sunday III Post Epiphany: Jesus, our Redeemer, is God. He works wonders and the Angels of Heaven adore Him. Jews and Gentiles will be obliged to recognize His royal Divinity. All the world is obliged to recognize the Social Kingship of Christ as King of all nations. The Epistle of St. Paul to the Romans encourages us to make acts of faith in the divinity of Christ, that we may enter His Kingdom which prompts us to extend charity to all men for the sake of our love for God. This is manifested in the Gospel today by the two miracles our Lord performed. Just a word from our Savior cleanses the leper, whose cure, officially verified by the priests, “serves for a testimony of the divinity of the Christ”. Then we have the heathen, a Roman centurion, who obtains by his confidence, a great miracle: he testifies with humility that Christ is God. So great is this humility that the very words of the centurion have been employed by Holy Mother Church in the Holy Sacrifice of the Mass with the Domine non sum dignus at Communion time. O Almighty God and everlasting God, Who choosest the weak things of the world to confound the strong: mercifully grant that we who keep the solemn feast of blessed Agnes, Thy Virgin and Martyr, may experience the benefit of her pleading with Thee. Through Jesus Christ our Lord, Who livest and reignest, with God the Father, in the unity of the Holy Ghost, God, Forever and ever. R. Amen.